boldly decorated with a large peony blossom at the front and with scrolling leaves filling the sides of the almost spherical vessel, all carved in multi-layered relief and finely detailed, the wide shoulder decorated with incised lines radiating from the base of the cylindrical neck flanked by a slightly curving upright spout opposite the arched strap handle moulded in relief with lozenge diaper pattern, the slightly splayed foot enclosing a gently domed base, the matching cover of stepped cylindrical form crowned with a short knop and pierced with two small holes at one side for attachment, all covered with a glossy translucent sea-green glaze showing light crackle throughout and pooling to a darker tone in the recesses to highlight the design. 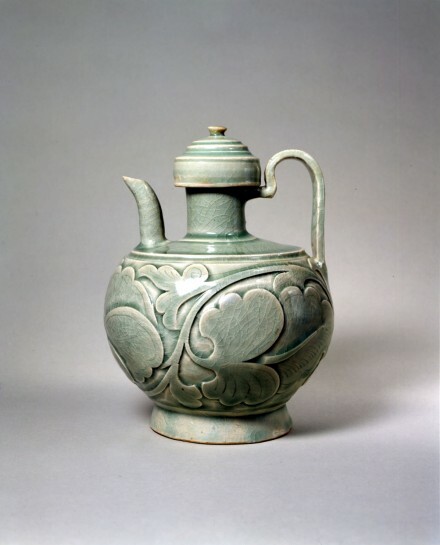 A very similar Yaozhou celadon ewer and cover excavated from the Huangbaozhen kiln site in Tongchuan county, Shaanxi province in 1972 and now in the Yao Zhou Ware Museum is illustrated in the catalogue of the exhibition entitled The Masterpieces of Yaozhou Ware, Osaka, 1997, no. 142, p. 105, dated by the authors to the 10th Century. Another very similarly carved Yaozhou ewer, lacking the cover, is illustrated in the catalogue of Selected Masterpieces from the Idemitsu Collection, Tokyo, 1996, col. pl. 102, and another of the same design with slightly misfired glaze is illustrated by Gompertz, Chinese Celadon Wares, London, 1980, pl. 39, p. 103. Compare also the example with twin spouts from the Hoyt Collection illustrated in Oriental Ceramics: The World’s Great Collections, Vol. 10, Museum of Fine Arts, Boston, Tokyo, 1980, col. pl. 20. A carved Yaozhou celadon ewer of closely related design, also lacking the cover, is illustrated by Krahl, Chinese Ceramics from the Meiyintang Collection, Vol. Three (II), London, 2006, no. 1472, pp. 470-471.